This Italian Bake-at-Home Bread from The Essential Baking Company fills your kitchen with the aroma of an Italian bakery. And the best part? You don’t have to do any work. (Well, besides putting it in the oven for 12 to 15 minutes.) Enjoy a porous, chewy crumb with a soft crust and a dusting of flour in every bite. 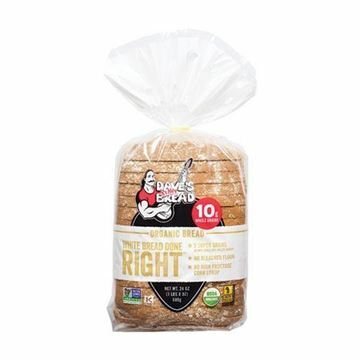 Made with only five ingredients, this organic loaf of bread is supremely satisfying. My family enjoyed the Essential Baking Italian Bake-at-Home Bread so much, they influenced me to write a review. This is the perfect answer to a bowl of hot chowder or stew on a cold week day night, and it's ready perfect in 8 minutes! If your quick or slow cooked meal is begging for bread to round it out, then this hearty and crackling crust with its chewy, yet airy body will pair well in a hurry. Be sure to top it with some delicious Smith Brothers Sweet Cream Butter! This bread is so yummy, the Italian flavor is delicious! We love spaghetti in our house and this and the sourdough flavor are great additions to our spaghetti meals. Super yummy. We've enjoyed Italian bake-at-home loafs before so we are familiar with this type of bread. Unfortunately, we were preetty disappointed. The loaf was smaller than expected and pretty tough chewing.